Trey Galloway of Culver had a nice game at the Tip-off. Only offer right now is IUPUI but that list will grow. Bossi said he reminds of Kellen Dunham. Would be nice to see BU get him in for a visit and soon. Jordan and Kampen watched him win a championship. I'm going to try and stay on top of creating all of these threads this spring/summer to keep things more organized and easier to follow who Butler is keeping tabs on. Dear God - quickness, gets to the hoop, can shoot. Just wondering why you have Trey Galloway in the 2019 Recruiting Profiles; is it because you don't have a Recruiting Profile set up yet for 2020? Correct. I didn’t want an entire section with just one player in it. This is the only 2020 profile I’ve gotten around to creating. Nice recruit. Unrelated, how does a team with the majority of players from places other than Indiana become eligible in the IHSAA? Is this the kid people think is an IU lean? And if so, why? Indiana kid. Iu staff has been on him a while. Early indications seem to be that the high school coaches like Iu’s New staff. Wouldn’t say he’s a lean because he doesn’t even have an offer, but it does seem like he favors them early assuming an offer does come. Ha—you’d hope Miller would be better received than Crean. Trey also spent time in Carmel when his dad coached and there is a definite IU bias in Carmel. I’ve got some ties to CMA (though I didn’t go there). I really don’t remember for sure, but I thought I remembered hearing there was some strong familial connection to IU. Anyone feel like they heard the same? Galloway was not there this weekend at Run N Slam, so I didn't get to see him. 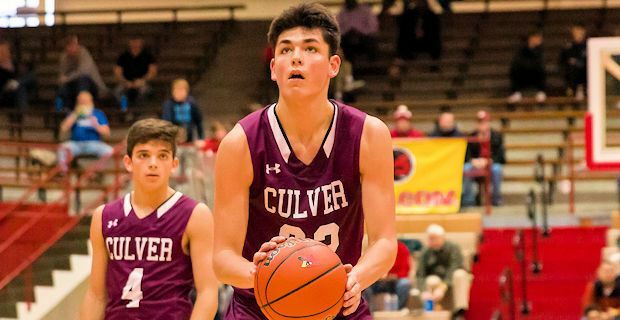 Culver Academy wing Trey Galloway (2020) picks up an offer from Butler. Tark43, bumba, cornette33 and 1 other person like this.